There is an ongoing debate between hand quilters and machine quilters – many hand-quilters believe that hand-quilting is the only way to quilt, whereas many machine quilters argue that you can’t really tell the difference and it is much more convenient, faster and easy! 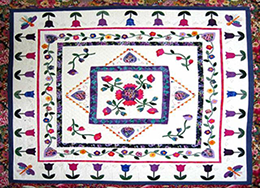 A description of how to do both types of quilting is given on the hand quilting and machine quilting pages accordingly to help you choose the best type for you. At the end of the day it is your decision, and you need to balance the overall impact you want your quilt to have, the time you have available and your past experience.